While catching up on a few beauty blogs, one that I follow mentioned a brand that really intrigued me. 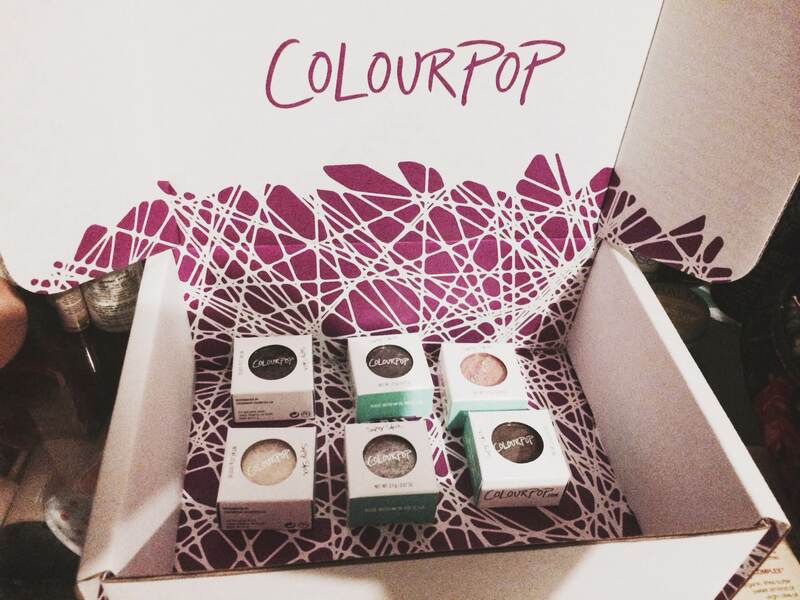 It was Colour Pop Cosmetics, and they do seem fairly new. I’m just basing that off of the fact that there’s not many reviews on them, but that didn’t stop me from being super curious. I went to their site (will be linked down below) and noticed that every shadow they sell is incredibly affordable at $5 per color! Plus, if you spend $30 you don’t have to pay shipping in the United States. These are also American made and cruelty free. So, I jumped right in and started picking out what colors I wanted to try. I limited myself to 6 (for now) but it was extremely hard to choose only 6. If you visit the site, you will understand why. Their colors and descriptions are all so unique and beautiful! First off, the packaging these shadows come in are completely life proof. There’s no way these shadows will randomly shatter in the mail (it’s a tragedy when it happens, yes?). When I received these in the mail they were in a giant box, with a smaller box inside, and each shadow was bubble wrapped and surrounded by more bubble wrap. Life proof, guys. Life proof. 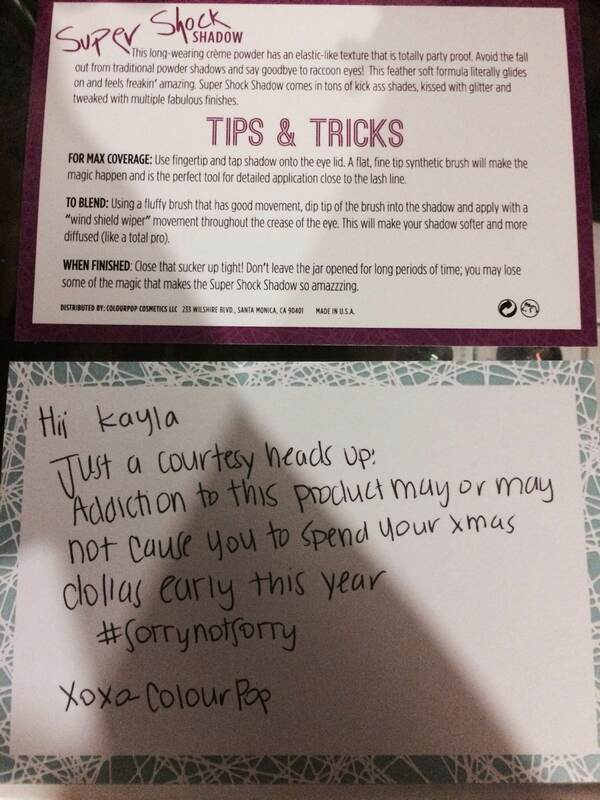 Second, there was an adorable handwritten note included in my package. I’ve never personally had a makeup brand hand write anything to me, so this was exciting! It also includes a separate card filled with how to use and care for these shadows. Once I get into the review of the actual product you will see why they include this card. Now for the actual product review. I am SO impressed all around with these eye shadows. Of course, I had to open and play with every color immediately and they are all buttery smooth and extremely pigmented. The texture is very hard to describe. They are soft and creamy, but not really. That’s why they say to store these air tight. They are a texture that can dry out if left out for too long. I don’t even know how I will ever use a full pot of any of them. Yes, they are that pigmented. I tried using the shadows with both my fingers (as they suggest) and with a brush, and they do indeed produce different results. Of course, using your fingers (clean, hopefully!) gives the best and brightest result. Truthfully, you probably wouldn’t need a primer if applying with your fingers. With a brush the results were still amazing, but definitely softer. All of the colors were still easy to blend out using either method. Friskie- a very sparkly black color with a hint of purple. I love this color. I feel this color may be my go to this fall and winter for creating a glamorous smoky eye. Bae- A sparkly neutral color with an egglplant color to it. That’s really the only way I can describe it. They describe it better on their site, of course. It’s beautiful! Unlike any color that I already own and I can’t wait to use this one. Meow- Meow was one that I bought mostly for the name. On top of being very colorful, I am a little bit in love with everything cats. This shadow comes in almost a tie-dye polka dot form that when blended together it creates a very beautiful grayish-violet color. Cheeky- This color is unlike anything that I typically go for. I do not wear many pinks, but this peachy apricot color caught my eye. It just seemed very girly and dainty, and I want to see if I can try it with a color like Mittens to create an eye look outside of my comfort zone. 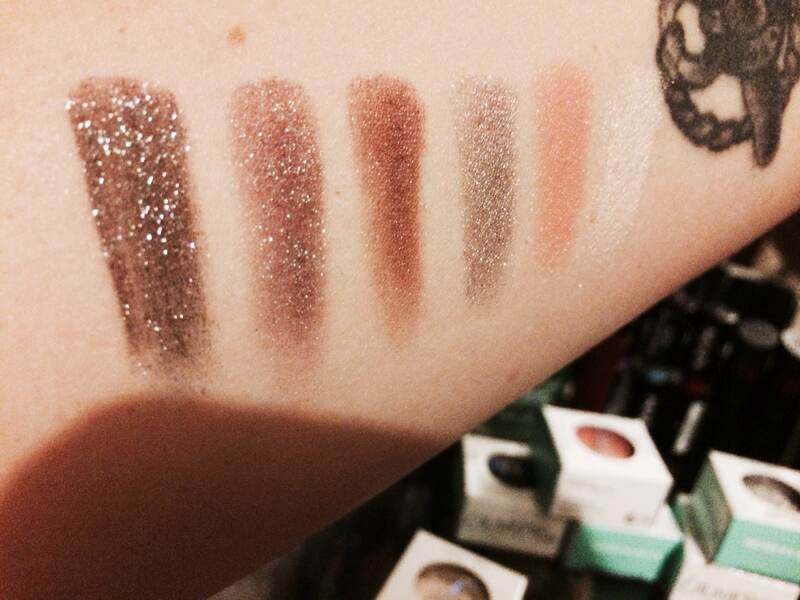 Girly- Sorry that this swatch doesn’t show up that well on my pale skin. It is a very pale and very shimmery pearl color. I love it! I use pearl variations of shades often for everyday looks to brighten my eyes up a bit. I will definitely reach for this one very often. In all, I love these shadows so far. From the packaging to the texture of the shadows themselves, it’s a brand that I would recommend anyone trying. At $5 a color, these are very affordable, and even more adorable. I was not endorsed in any way to review this product. These products were purchased with my own money and I have done this review on my own time. All opinions are my own.